Life, liberty, and the pursuit of happiness can't be found in a motel room, at least on a business trip. Obviously, it shouldn't be expected, either. Where to look then? A CD store, of course. While visiting Manifest Records (a worthwhile store in Charlotte, NC) for used treasures, I noticed a wall with posters advertising concerts at a local venue. As the title above has already revealed, James McMurtry was to be in town the following evening, with tickets costing a cool $17. No Ticketmonopoly service fees involved. That's a refreshing, "Nada. Zip. Zero. None." It's amazing how fast we can "think" through things, and I won't enter into discussion as to whether quick decisions tend towards the angel on one shoulder or the demon on the other. In this case, the conversation with myself went as follows. Can I even find the venue? (No, but the GPS can). Can I manage to do my work the following day with 6 hours of sleep? (Of course.) Okay, can I do it well, though? (2 beers max. Yes). Am I going to get mugged or worse in a strange part of town? (Good one. Better ask the the guy at the counter). A quick conversation later, it was all systems "Go!" 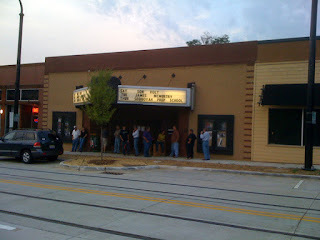 The concert was at The Visulite, a small converted movie theater that holds maybe 400 if it were packed. After enjoying Paul McCartney from a half mile from the stage, 20' certainly has a natural appeal. 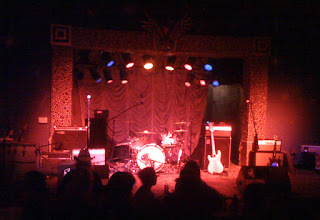 This club's bookings had many artists with which I was not familiar, but it has hosted some fairly popular ones (to those who stray from the Top 40) as well, such as Drive-By Truckers and Son Volt. Noodles restaurant nearby. The club has a seating area that includes stools and high bar tables, with an accompanying bar with a good mix of 12 draft beers and a wider variety of bottled beers than I would have expected. Flying Dog Classic Pale Ale was the (well selected) fortification of choice for the evening. The opening act, Johnny Burch, was okay. He had good lyrics, an enthusiasm for his work, and confidence in his guitar chords. A song about El Paso stood out, though I don't know the title. 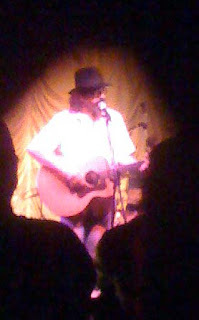 McMurtry took the stage before an estimated 200 people at the scheduled start time and played 2.5 hours, including one encore. Classifying musicians like him is difficult, and most seem to be thrown into a bucket known as "Americana." It's not rock music, and it's not pop, country, jazz, blues, folk, gospel, r&b, easy listening or other recognizable genres. So, Americana it is. But his music is almost a few of these. At times, he certainly rocks - electric guitars will do that, but his lyrics contain too much narrative and, dare I say, thought, to fit within that classification. Folk then? His lyrics tend to more of a Guthrie/Dylan perspective of story telling and opinion, but the presentation often rocks too much. I guess this is the same problem folk purists had when Dylan went electric. Genre's notwithstanding, he is an exceptionally talented lyricist, with songs generally more cohesive than much of Dylan's, delivered in a posture seemingly fashioned intentionally after John Lennon. He's also opinionated about politics, but he mostly stayed away from this subset of his work. The "it was worth it" aspect of the concert was his guitar work. I ususally hear the music of a song and eventually pay attention to the lyrics some time later. With McMurtry, he has a resonance to his voice that draws attention, so I was surprised to see how active on the guitar frets he is. He certainly played a lot of chords, but his picking and solos were very enjoyable. Bastards, who might be described as "capable." It's obvious who people came to hear, after all. The band included Jim Brock, a jazz drummer of some note, who filled in with percussion that seemed to be spontaneous. loner seated near me filled me in on some of my favorites - "Red Dress," "Choctaw Bingo," "Fireline Road," and a rousing "Too Long in the Wasteland." My only disappointment was that he didn't engage the audience much between songs, but that is not uncommon. The sound was good, and it was well worth the investment. Kudos to my wife's artist friend, Brenda Griffith, for pointing me towards his work. The concert also afforded me the opportunity to lament the iPhone's inability to handle concerts - at least where it's dark with stage lights on the subject. After carefully shielding my lens from much of the stage light, the best I could do was at right. I know... I know...if you want to take pictures, take a camera, not a phone. McMurtry (also the son of novelist Larry McMurtry) played only a couple songs on solo acoustic, but below is a video that captures his sound and lyrics pretty well.